Sorry this is up so late. That damn motivation thing keeps tripping me up. I’ve also come down with a gross cold. So, we start off this episode with Usagi being sad and missing Mamoru. I feel so much for her. I hate when Usagi doesn’t smile in this anime. Honestly, I find it hard to go back and watch the old anime after watching this one. It just seems so damn slow. She winds up walking to school and bumping into a guy that looks like Mamoru. The moon phase watch starts ticking again. Turns out that it IS Mamoru, but he’s evil Mamoru with red eyes. He hypnotizes Motoki into thinking that he’s Endo, Motoki’s best friend. When Usagi meets him, she wants to believe its Mamoru, but he still says he’s Endo, and immediately thinks she’s Sailor Moon because of her hairstyle (I’m SO glad that someone instantly thought that FINALLY in the Sailor Moon universe!). He tries to hypnotize Usagi into giving away Sailor Moon’s secrets, but it doesn’t work on her. She bails out before she can reveal anything, and is really torn about if it’s the real Mamoru, or a fake monster made to look like him. But, even if Mamoru can’t hypnotize Usagi, he’s pretty successful at hypnotizing Mako-chan. She leads them right to the secret communications base under the video arcade cabinets (Makoto, you dummy!!!!) She calls Usagi and the others to come there, but it’s a trap to get the Legendary Silver Crystal. He gets Makoto to steal it, but she then gets knocked out, and the Senshi transform. We get to see a full, real Sailor Venus transformation, and when she fights with her whip, she’s all badass as hell. I love when she uses it to grab the Silver Crystal away. 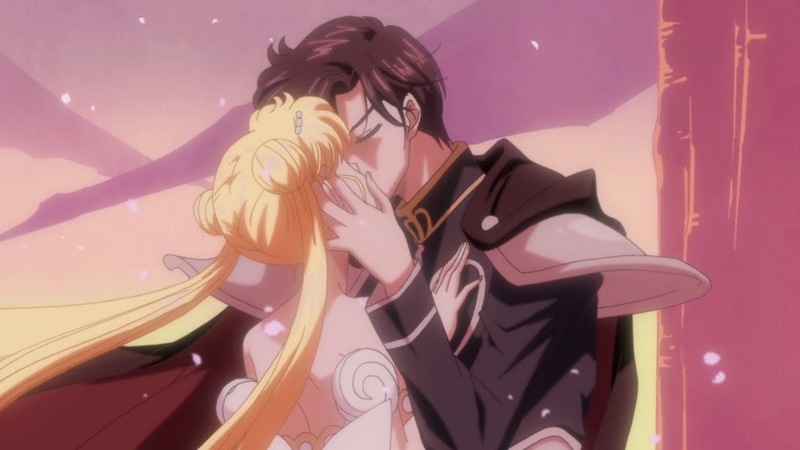 During the fighting, Usagi doesn’t transform because she can’t face the idea of fighting a creature that looks like Mamoru, but when Luna goes in and bites him, and she’s thrown away and injured, that spurns Usagi into action. She gives the most heartbroken ‘Moon Prism Power’ ever, and fights against him, trying to purge the evil away. Her tears for Luna cause the crystal to shine brightly, but before she can make any headway with the evil Tuxedo Mask, Beryl shows up to ruin all the fun. She finally introduces herself, and seems a little put out that Princess Serenity doesn’t remember her. But she does point out that it’s the real Tuxedo Mask, and thus the real Mamoru she’s fighting against, and that causes Usagi to hesitate, and causes us to have to wait two weeks to find out more. I seriously hate the waiting. I guess that means I’ll just have to have ANOTHER mini marathon of watching all the new episodes back to back.